Flo Braker has been teaching baking across the country for almost thirty-five years. She broke new ground in the literature of dessert making with her cookbook The Simple Art of Perfect Baking and the award-winning Sweet Miniatures: The Art of Making Bite-Size Desserts. She also collaborated with other bakers on The Bakers Dozen Cookbook. Her most recent work is the 2009 James Beard Award-nominated book Baking for All Occasions. She has been the Baker columnist for the San Francisco Chronicle food section since 1989. 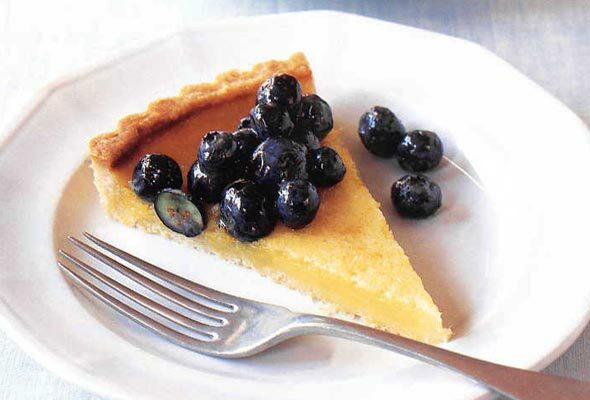 The fresh flavors of lemon and blueberry are at their best here in Flo Braker’s easily assembled, elegant tart. “Absolutely the best thing I’ve put in my mouth in a long time!” That’s what folks are saying about this buttery, citrusy coffee cake. This tender cake is the next best thing to a cup of eggnog, flaunting those familiar flavors of rum and nutmeg. All the red velvety goodness of the classic cake in a not-so-classic form factor that’s wrapped around white chocolate cream. Um, yum. This luscious, buttery-flavored pound cake is scented with vanilla, almond, lemon, and orange. An apricot filling puts it over the top. Take just one bite of Flo Braker’s chocolate cake slathered in pistachio Bavarian cream frosting and we guarantee it will become your favorite dessert. These chocolate and rum buttercream creatures are known as Igels in Austria, where these edible versions bring a bit of whimsy to the everyday. Just like a chocolate kiss, sorta, except they’re ethereally airy with a slight shortbread crunch. Definitely still chocolatey, though. Golden caramels—literally, that’s what these are in taste, color, and decoration. This classic sweet pastry is made richer and sweeter than ordinary piecrust with the addition of egg and sugar.